Our reconstructed skin models have been optimized to analyze the impact of chemicals, active ingredients and products on tissue architecture and physiological properties like cell growth, skin metabolism, the synthesis of collagen, elastin and other extracellular matrix proteins and many more. The human Phenion Full-Thickness Skin Model mimics native human skin in diverse dimensions, such as in histological architecture and in a wide spectrum of physiological and biochemical parameters. Its biological equivalence with human skin makes the tissue perfectly suited as in vitro alternative to animal testings, e.g. in the 3D Skin Comet assay for genotoxicity testing and in a vast variety of research applications as listed below. The Phenion FT Skin model is ideally suited to study the interactions between epidermis and dermis. Based on our special culture conditions, the skin model differentiates and stratifies similar to native human skin, which includes the generation of a horny layer. Analyses can be conducted with the whole tissue as well as with both compartments, dermis and epidermis, separately. A protocol for the enzymatic separation of the tissues can be found in our download center, together with protocols for the extraction and analysis of DNA, RNA and proteins from the skin tissue. 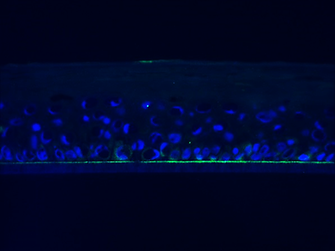 Visualization of exemplary differentiation proteins by immunofluorescent labeling. Immunohistology shows well organized epidermal differentiation. 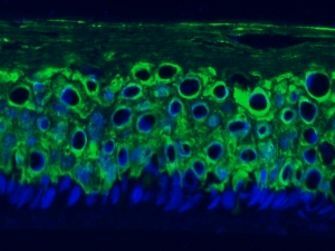 Ki67 antibody localizes proliferating basal keratinocytes in the epidermis. Cytokeratin 10/15 immunostaining of matured Phenion FT Skin Model. Optical coherence tomography ‏(OCT) is used as non-invasive tool allowing fine-meshed batch control. The minimal order quantity comprises 6 FT skin models ‏(Phenion FT Skin Model Kit, order number FT SM-6) and can be purchased at a price of 900 $/kit. Please note: kits with higher skin model quantities can be purchased at a price of 150 $ per additional tissue, according to your individual needs. All Phenion FT Skin Model Kits are equipped with sufficient materials required for the culture of the tissues. The materials delivered with the kits enable individual tissue culture in six separate vessels or the joint cultivation ‏‏(e.g. 2 x 3 or 1 x 6) of the skin models. *Please order 250 ml ALI-Medium ‏(ready-to-use) separately to culture six skin models. For further instructions, please take note of the Phenion FT Skin Model Kit Instructions for Use, available here. Our latest innovation - the Phenion FT AGED Skin Model - is a surrogate for aged human skin. It mimics mature human skin, both in structure and physiology. The Phenion FT AGED Skin Model is characterized by a connective tissue with senescent fibroblasts, reduced synthesis of extracellular matrix ‏(ECM) proteins like collagen and elastin, and elevated MMP secretion ‏(Scholz, 2014, Master thesis; Dieckmann et al., 2016). With these features, the Phenion FT AGED Skin Model is an ideal research tool to study the basic biology of skin ageing mechanisms and to develop formulations which can delay or even counteract ageing. In the Phenion FT AGED Skin Model the dermal fibroblasts are treated with mitomycin C ‏(MMC) for 48 hours before adding the keratinocytes. The cytostatic drug MMC is an alkylating agent, which, after becoming activated within the cells, leads to covalent crosslinking of the DNA strands ‏(Lee et al., 2006). Crosslinked DNA sections cannot be further transcribed or replicated, and cell proliferation stops. In addition, activated MMC generates reactive oxygen species ‏(ROS), which can damage the DNA, too ‏(Alili et al., 2014). Both effects, cell cycle arrest and ROS generation, are characteristic for the extrinsic and intrinsic ageing of the human skin. It could be demonstrated that human dermal fibroblasts can be arrested in the cell cycle and driven into senescence when they are treated with MMC in culture. The table exemplifies some skin ageing features of the Phenion® AGED Skin Model in comparison to our standard full thickness skin model. The minimal order quantity comprises 6 FT AGED skin models ‏(Phenion FT AGED Skin Model Kit, order number FT AGED-6) and can be purchased at a price of 1080 $/kit. Please note: kits with higher skin model quantities can be purchased at a price of 180 $ per additional tissue, according to your individual needs. The Phenion FT AGED Skin Model Kits are equipped with sufficient materials required for the culture of the tissues. The materials delivered with the kits enable individual tissue culture in six separate vessels or the joint cultivation ‏‏(e.g. 2 x 3 or 1 x 6) of the skin models. 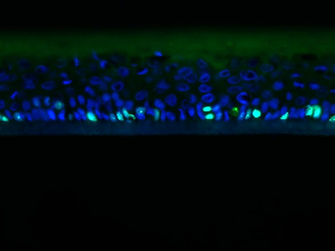 The Open Source Reconstructed Epidermis [OS-REp] is a cost-effective alternative for applications which do not rely on OECD-approved tissues and methods or which do not need complex skin equivalents. The OS-REp consists of carefully selected primary human keratinocytes cultured under air-liquid interface conditions. All epidermal layers characteristic for native human skin are developed including a multi-layered stratum corneum. Its high xenobiotic metabolic competence is comparable to that expressed in the epidermis of the Phenion® Full-Thickness Skin Model and in human skin ‏(Wiegand et al., 2014). OS-REp tissues are grown in inserts on a chemically resistant polycarbonate membrane ‏(effective tissue surface area 0.63 cm2). 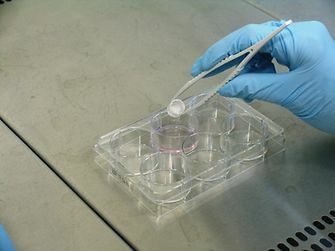 Due to small spacers ‏(“feet”) underneath the tissue-containing inserts, they can be placed in diverse cell culture vessels of different sizes to e.g. allow for co-culturingThus, the OS-REp can be handled very flexible to cope with many different experimental set-ups. The medium volume in the chosen cell culture vessel must be thoroughly adjusted to guarantee air-liquid interface conditions and nutrient supply over a certain period of time. Table 1 lists the required media volumes to culture different numbers of OS-REp models in different culture vessels. Medium must be changed every 48-72 hours. Based on the OS-REp, an in vitro skin irritation test was developed which follows the conditions defined in the OECD test guideline 439. The test method has been validated in a multicentric study with several international partners according to the OECD Performance Standards for in vitro skin irritation tests. The test results, which have proven its good predictive capacity, as well as the technology behind the OS-REp models have been published (Mewes et al., 2016; Groeber et al., 2016). A detailed SOP for running the in vitro skin irritation test can be downloaded from the Information Center of the Phenion homepage. OS-REp models can be ordered at any number needed at a price of 45 €/tissue ‏(product ID: OS-REp-1). The models can be cultured under air-liquid interface conditions either individually in the wells of a 6-well plate or in groups, e.g. 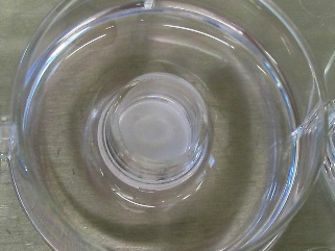 in medium-sized ‏(Ø 10 cm) or big ‏(Ø 14.5 cm) petri dishes. The respective number of sterile 6-well plates and petri dishes, adapted to the number of requested tissues, are included in the shipment. Please note: According to individual experimental needs, Phenion Air-Liquid Interface (ALI) medium shall be ordered separately and is available at 3 different sizes: 125 ml, 250 ml, and 500 ml (product ID: OS-REp ALI-CM-125/250/500). Instructions of Use can be downloaded from the “Information Center” of the Phenion homepage.